Mountaire Farms' shift to Interstate Container's recyclable GREENCOAT® wax-free boxes benefit New York City by reducing greenhouse gases. Making the world more sustainable is a tough job, and we don’t often see the results in our day-to-day lives. Every once in a while, though, we get to see the direct outcome of our work right in our own backyards. This time, saw the positive effects of a 2011 work project at a North Carolina chicken farm evident on the evening streets of New York City. Every day, our Coalition for Resource Recovery (CoRR) team works to pilot and promote effective waste recovery systems and the use of products that are designed for recyclability. One of our major accomplishments of 2010 was helping Mountaire Farms, operator of the largest poultry processing plant in North America, to convert to the use of 100% recyclable coated boxes made by CoRR member Interstate Container. Boxes coated with paraffin wax cannot be recycled and end up in landfills, so the company’s conversion to using GREENCOAT® recyclable packaging set a standard for the poultry industry. 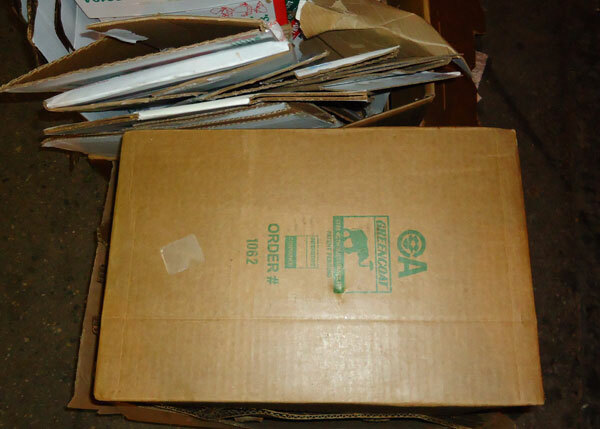 The switch to recyclable boxes also directly benefits New York City, by turning the 6,000 tons of Mountaire’s poultry boxes that come into the city annually from a waste into an asset. If all of these boxes are recycled, the city’s greenhouses gases are reduced by 21,000 mtCO2e per year — that’s the equivalent to adding 189 acres of trees to Central Park and amounts to savings of $1.2 million in trash disposal fees for NYC restaurants and grocers. Additionally, NYC waste haulers who collect those boxes can sell them for about $100 per ton, instead of paying to bury them in a landfill. Earlier this week, we saw the impact of our work when a local business was caught green-handed using recyclable poultry packaging. 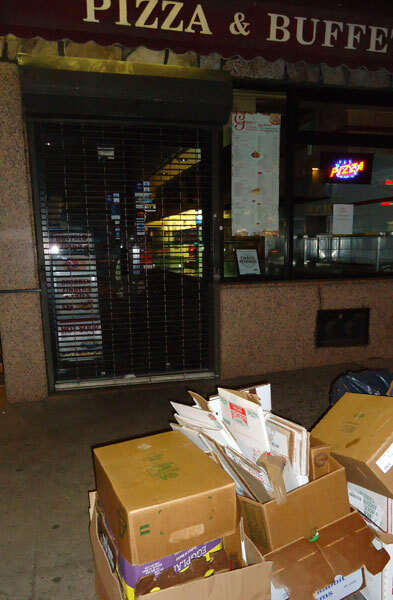 Annie White, the Director of our New York office, spotted a few of Interstate Container’s recyclable chicken boxes in front of Pizza and Buffet, a local restaurant just a few blocks from our office. The boxes were ready to be picked up along with the regular cardboard and Annie was literally able to see (and snap a few photos of) our local NYC businesses saving money and helping the planet in the process. While it may seem strange to get excited about trash, those boxes are a great reminder that our work has far-reaching, positive impacts for communities across the country, including our own. Here’s hoping our recent recyclable produce box pilot in Santa Cruz, CA, helps bring some more recyclable packaging to NYC.